If you are like me, then you’ve probably spent countless hours reading numerous online forum posts on how you can drive faster or how to make your car faster and anything in between. There’s nothing inherently wrong with that, much (if not most) of my car related knowledge has been gleaned from various internet sources. Unfortunately, without doubt, you reach a point where it’s difficult to separate truth from fiction, or actual facts from someone’s anecdotal evidence. The trick is to take it all with a grain of salt, to take the most commonly held beliefs as mostly the truth. You can always improve your odds of receiving good advice by considering the source, there are some fairly well known and respected individuals out there who do take the time to entertain questions in a public forum, or better yet, catch them at the track. But when all else fails, and you reach a plateau of knowledge, step it up by going old school. Books, yes books. Those bound paper things I’m currently using to flatten out wrinkled decals with. 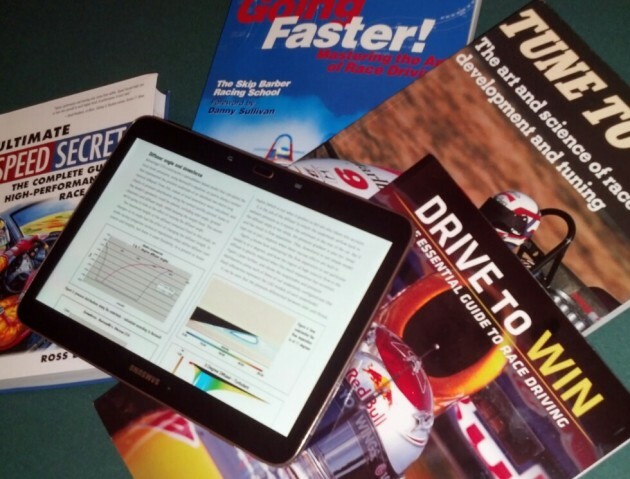 I’ve already got a healthy collection of professional development books, along with a suitcase full of technical manuals and federal publications related to aviation but nothing in the motorsports or performance driving realm. So I hit the interwebs a bit more, in search of the best publications on the subject. Of course Amazon provides a healthy list of candidates, and what’s more, in cheap slightly used form. A few minutes later and my virtual shopping cart was filled with titles such as “Speed Secrets”, “Tune to Win”, “Going Faster!”, and “Drive to Win”. I also recently acquired an Android tablet, a Galaxy Tab 3 10.1″ to be exact, to use as an e-reader, web browser, and all-around useful tool. I promise to provide my opinions on these pubs as soon as I finish them. So far I’m a third of the way through with “Going Faster!”, which is the Skip Barber Racing School’s “bible” of sorts. So far, so good. It’s a great deal of information, some of which I was fairly familiar with, but presented in easy to understand terms with helpful graphic depictions. It has really helped put a more technical or scientific spin on what I was already witnessing at the track in the car. I’ve also utilized the tablet to consolidate my service manuals for all my cars, making for a handy shop tool. It also allows for watching of YouTube DIY videos, online forum how-to’s, and any other source of information than can be found on the Internet. A very smart purchase indeed. In fact, I’ve already had a number of cyber-buddies forward scanned copies of articles on subjects ranging from under-body aerodynamics to instructor development. Chad Morehead has an excellent blog on track day tinkering and driving called Eat, Sleep, Tinker. This is reprinted with his permission. Visit his blog at www.eatsleeptinker.com.